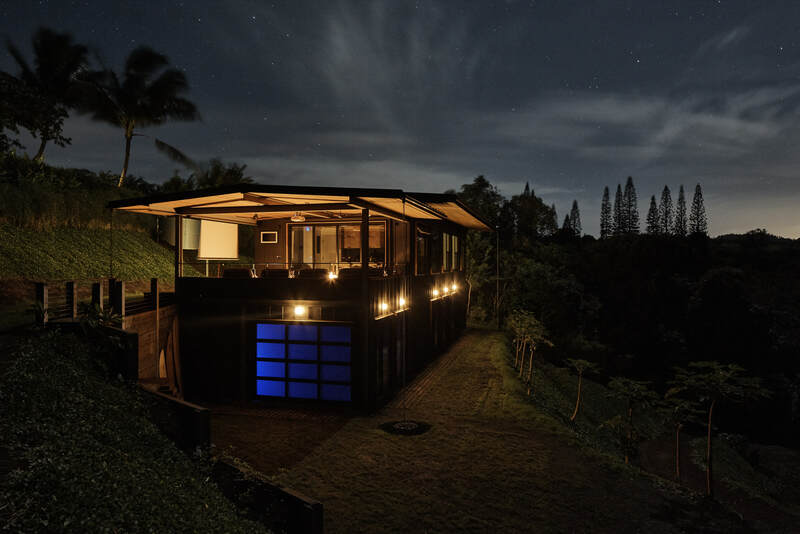 The plan has always been for LifeEdited Maui to be off-grid yet luxurious – green without the sacrifice. We always want to be smart with how we use energy. But we also want to enable the Thanksgiving scenario – lots of friends and family over, kids playing video games, adults cooking up a storm, lots of hot water being used. All without worrying about energy usage. All powered by the sun. So how did we do it? Primarily with Sunflare SUN² solar panels and Blue Ion 2.0 Energy Storage. In a leading edge system designed by our friends at HAWAII OFF-GRID. We wanted to find a company that shares our vision of leaving the planet better than we found it. Happily, our island neighbors Blue Planet Energy share this vision. 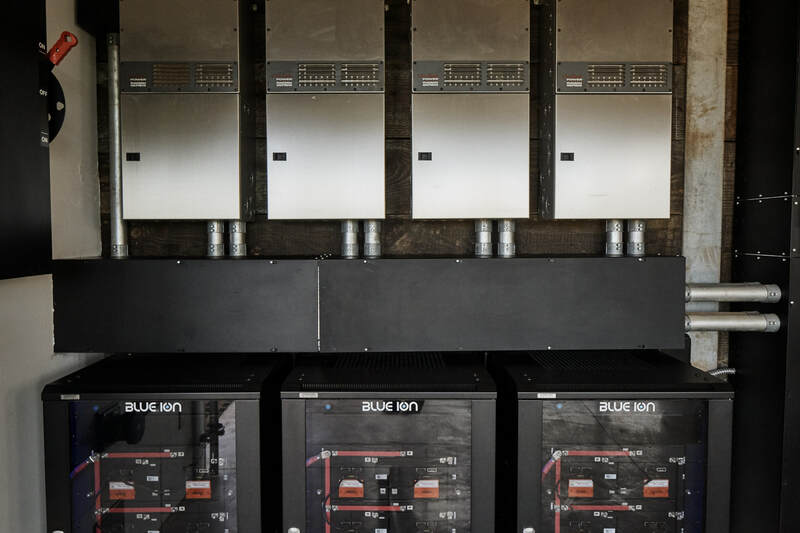 Batteries have been a key missing piece in our sustainable future, but the Blue Ion 2.0 Energy Storage system changes that. 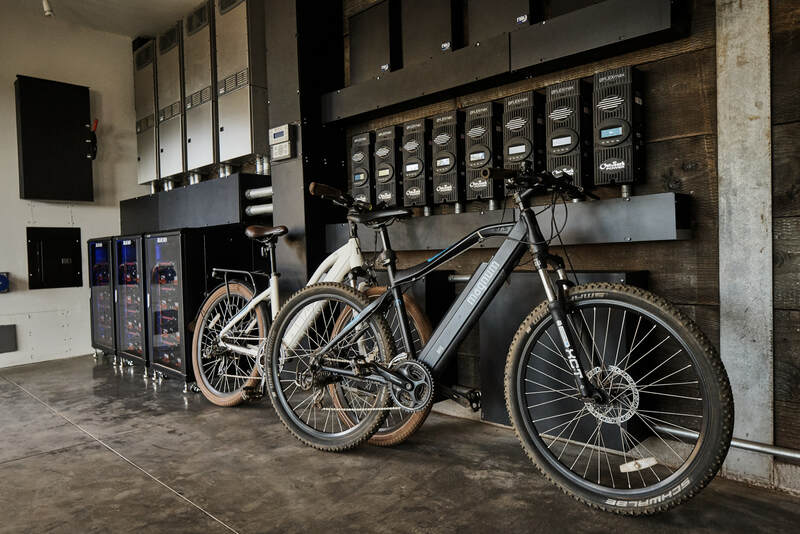 A green off-grid house needs strong batteries, in fact the battery system is in many ways the backbone of the off-grid system. Simply stated, you have to store energy so you can live a happy life even during a cold dark winter week. This used to be surprisingly difficult and complex. The Blue Ion 2.0 Energy Storage system changes that – it’s so innovative that it makes you forget how difficult it used to be. Fundamentally, it just works – reliable, powerful, no fuss. Performance is excellent – rapid recharging and high output mean that you don’t have to change your lifestyle. You also don’t have to worry about safety. The science of Lithium Ferrous Phosphate (LFP) chemistry makes the batteries much safer than competing products. The reliability is exemplified by the 15-year performance warranty – best in the business. Our particular setup is a 48kWh battery system. BTW, you can also easily use wind turbines with this system. As a fun side note, we got to spend time with the designer of the Blue Ion 2.0 Energy Storage System. His intention was to create the best battery system on the market. We think he succeeded. And we think it will help drive the adoption of clean energy systems in general. That’s a Sunflare SUN² solar panel. It doesn’t look like your normal solar panel, does it? It’s not. It’s better – lighter, thinner, more flexible, greener, and more attractive to boot. 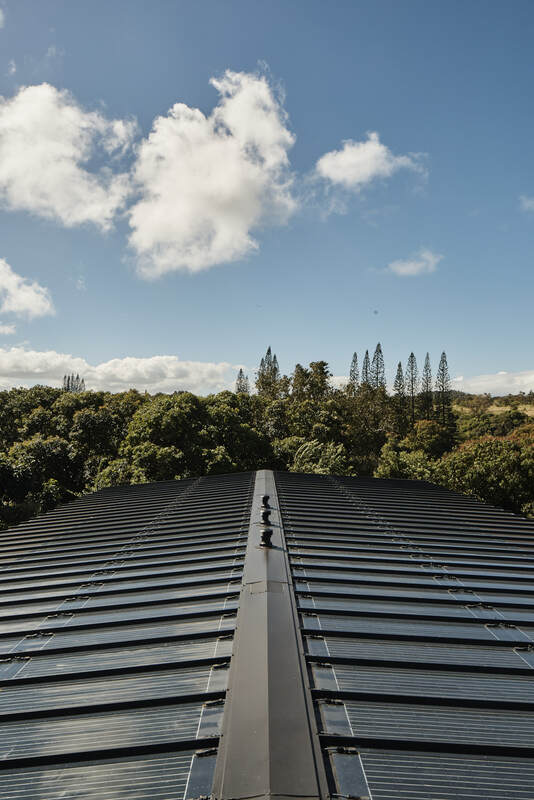 We used industrial strength double-sided tape to mount the panels directly to our metal roof. Which looks fantastic – see the photos below. And we feel good knowing that these are the greenest mass produced solar panels on the planet – no toxic chemicals used in manufacturing, also less water & energy used, no framing needed, no glass needed, and no silicon purification needed. Our particular setup is 10.1kW photovoltaic array. So what is the technology? It’s a new generation of CIGS (Copper Indium Gallium Selenide) panel. Which provides some favorable characteristics relative to traditional solar panels. For instance, they perform better in cloudy weather. 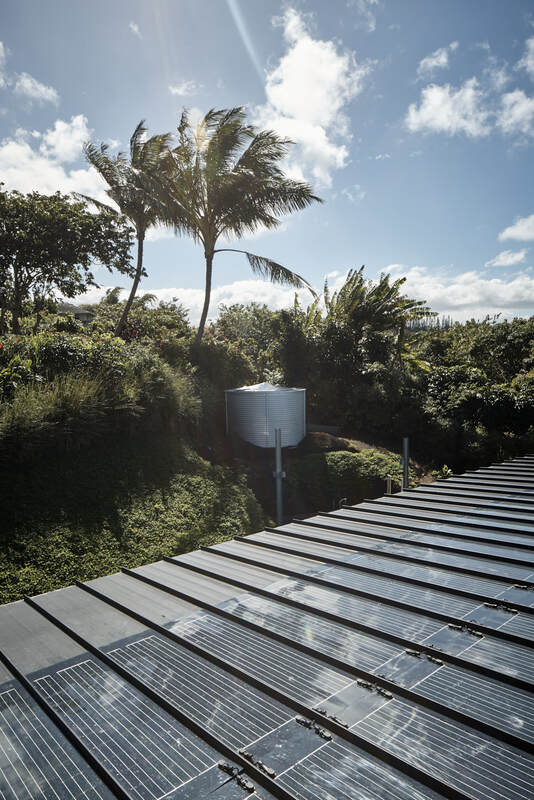 Maui winters are surprisingly cloudy, and with an off-grid system you really need to generate energy during weeks of mostly cloudy weather. CIGS panels also perform better during the low light conditions of dawn and dusk. The bottom line is that the panels generate all of the energy that we need. And they do it with style. The Sunflare SUN2 solar panels and the Blue Ion 2.0 Energy Storage system work very nicely together as a leading edge system. But for clarity, they don’t require each other – we’re just fortunate to have both systems. Want to know more about LifeEdited Maui? See the detailed description, subscribe to our newsletter, follow us on Instagram, Facebook, and Twitter. Would you like a home, apartment, or apartment building like this? If so, read about our services And if you are interested in renting or owning LifeEdited Maui or the LE2 apartment in NYC, please contact us. Please click on a thumbnail to see a slideshow. Bloggers and journalists are free to download the web resolution photos or the high resolution photos. It isn’t mandatory but it is much appreciated if you can credit Shawn Hannah for the photography. This post is one in a series that describes LifeEdited Maui. LifeEdited Maui embodies our green, space efficient, and minimalist principles. We view it as a lab for experiencing things that are consistent with these principles. The products described in this post were given to us, which we appreciate, but we would not have accepted if we didn’t believe in them. LifeEdited Maui in the New York Times!